Conservative commentator, author and filmmaker Dinesh D’Souza was indicted Thursday for campaign finance fraud. 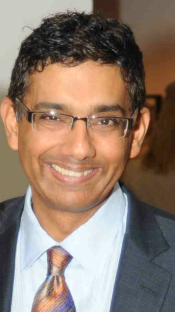 Since many readers might not be familiar with D’Souza’s life and work, The National Protrusion thought it fitting to ask, Other than being indicted, what else has Dinesh D’Souza done? 2007 – Publishes “The Enemy at Home: The Cultural Left and its Responsibility for 9/11.” The book alleges that the American political left bears much of the responsibility for the radical Islamic rage that fueled the 9/11 attacks. Curiously, it also blames Paul Krugman for the melting of the polar ice caps. 2009 – Publishes “Life After Death: The Evidence.” The book seeks to explain through scientific fact and philosophical argument that the afterlife exists. D’Souza claims he does not believe in reincarnation, per se, but if it does exist, he would like to return to earth as Nancy Reagan. July, 2012 – Releases “2016: Obama’s America,” a documentary related to his 2010 book, “The Roots of Obama’s Rage.” Both posit that Obama is secretly attempting to undermine the global ambitions of the United States, because he is vicariously living out the dreams of his anticolonialist father. Coincidentally, D’Souza is also living out the dreams of his father, who always wanted to be an awful writer.